Atheneum/Caitlyn Dlouhy Books, 9781416953739, 48pp. From the legendary songwriter Diane Lampert, based on a musical piece she wrote with Pulitzer Prize and nine-time Grammy–winning jazz musician Wynton Marsalis, comes an exquisitely illustrated folktale about how we humans got some of our…naughtier…traits, and what overcomes them all. Mother Nature is a very busy woman. Her job is to tend to the Earth and all the creatures that dwell there—she must wake up the bulbs and warm the land in spring, then rush off to freeze the ponds and create snow in winter. But more than anything, Mother Nature wants children of her own. So with twigs and things she made five: Fear, Envy, Hate, Greed, and Fickle. She asks the most helpless of creatures—the poor, wingless humans—to watch over them as she works. But then her children’s wild personalities begin to seep into human nature in a way that Mother Nature never intended. A lilting, lyrical ode to all of our human shortcomings and the one trait—love—that can overcome them all, this book beautifully captures the complexity of us all. Diane Lampert (1924­–2013) was a renowned songwriter who contributed to lyrics for artists from The Beatles to Brenda Lee and over twenty movie title tracks such as The Snow Queen, I’ll Take Sweden, Billie, and Silent Running, as well as songs for The Wild and the Innocent, and Trees Lounge, and for Bob Hope, Gary Grant, and Buster Keaton, among others. Suite for Human Nature first debuted at a concert at Jazz at Lincoln Center, with the world-famous Boys Choir of Harlem. Lampertwrote the libretto for Wynton Marsalis’s 2004 Suite for Human Nature, anallegory about how love tames aggressive emotions. In this adaptation,Puybaret’s (Alice in Wonderland) gauzy and gracefulpaintings on linen create an ethereal ambience; a fairylike Mother Nature withumber skin and a flowing aqua gown with petal accents sustains the weather,flora, and fauna. Mother Nature tends the Earth and cares especially forhumans, but she also yearns for children of her own. One by one, she craftslittle troublemakers named Fear, Hate, Envy, Greed, and Fickle. The genderdynamics are questionable, since all are boys except flirty Fickle. WhileMother Nature governs the seasons, “waking up bulbs” in spring and “ripen[ing]the fields” in summer, she leaves humans in charge of her children and returns toan ever-more-volatile populace. At last, after consulting with the four winds,the anxious Mother Nature creates girl twins who model patient Love.Reminiscent of the story of Pandora’s box and other creation tales, this gentlytold allegory avoids its violent implications and favors optimisticresolutions. All ages. 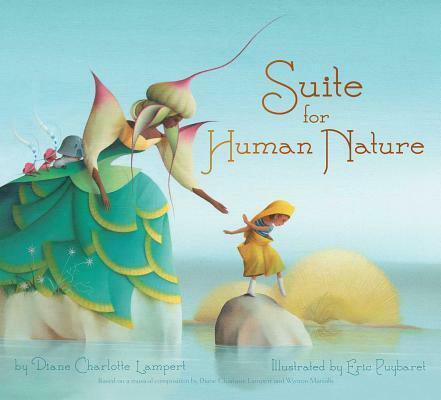 Based on a musical composition by renowned songwriter Diane Charlotte Lampert and Grammy-winner Wynton Marsolis, this stunning book attempts to explain why humans behave as they do. As the story goes, there once lived Mother Nature who cared for all living things. She felt sorry for Humans and gave them all they needed in exchange for helping her manage the earth. Mother Nature longed for her own child and so she created a child whom she named Fear. Leaving to create winter, the Humans were left to watch over Fear. Upon her return, she found that Humans now feared one another. She decided to try again and this time created Envy, followed by Hate, Greed, and Fickle. Realizing that she could not handle her mischievous children and the world at the same time, the North Wind suggested that Mother Nature make a child wild and free like herself. So, Mother Nature created twins named Love, who taught their siblings to play together, to give rather than take, to laugh as they sought out the positive, and most of all, to love. A celebration of humanity with all of its shortcomings and its ability to love, this beautifully orchestrated tale, illustrated in magnificent paintings, demonstrates the healing power of love and how it transforms human nature.